As usual in the world of fashion, people with an abundance of influence, control, and power tend to set the current trends and styles. This has always been true since the dawn of time. The only difference that back in the Olden Days the monarchs set these trends, while now it is usually celebrities. 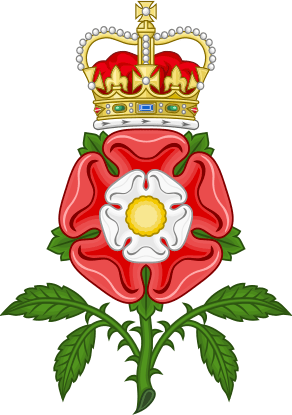 Although numerous monarchs influenced Renaissance fashion, the Tudor monarchs of England had perhaps the most important impact on Western European fashions of the 16th century. 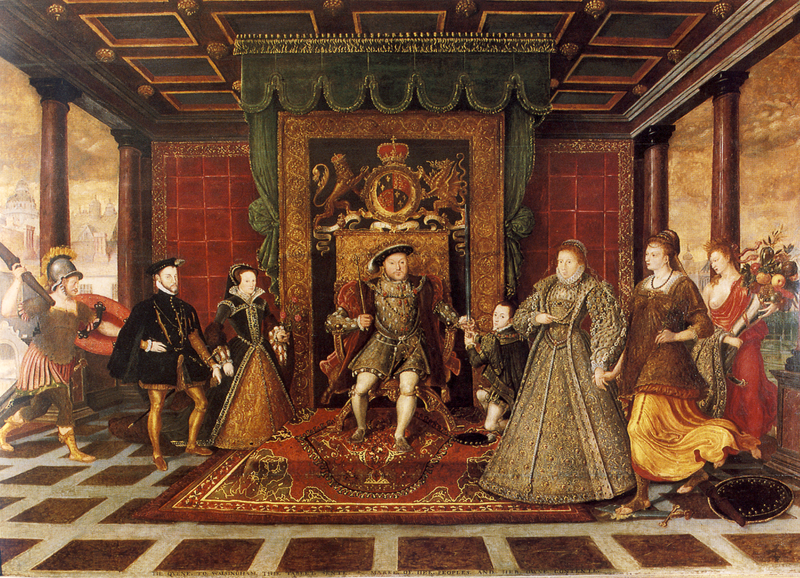 And out of these monarchs, the most influential were Henry VIII and Elizabeth I. Subsequently, his styles became fashionable throughout the Western European empires. Methods, such as slashing & puffing and stuffing sleeves & shoulders, that enlarged the figure became wildly popular during his reign and remained even after his death. Even women’s clothing exhibited more fur and larger sleeves. His six wives also made some considerable contributions. Katherine of Aragon from Spain introduced the Spanish farthingale to England. 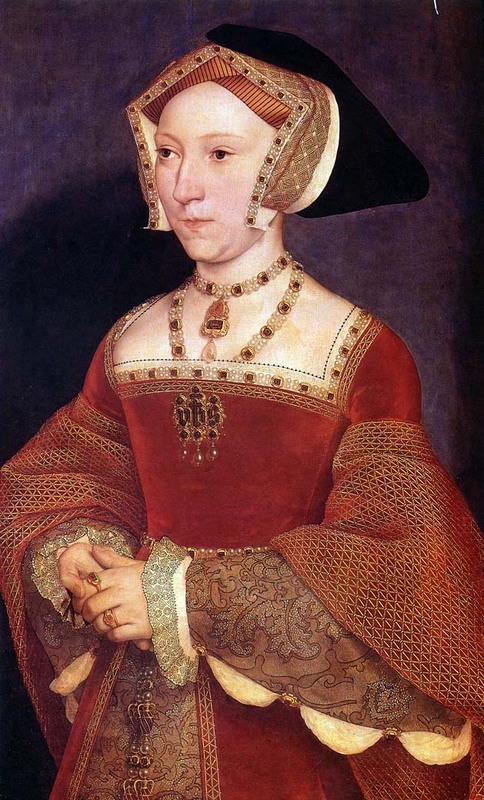 Anne Boleyn made French fashions of crescent caps/French hoods and tight, square-necked bodices popular in royal courts (although not French herself, she spent a few years there serving as maid of honor to Queen Claude and lady-in-waiting to Archduchess Marguerite). Anne of Cleves introduced Flemish styles the English court, including leg-of-mutton sleeves. 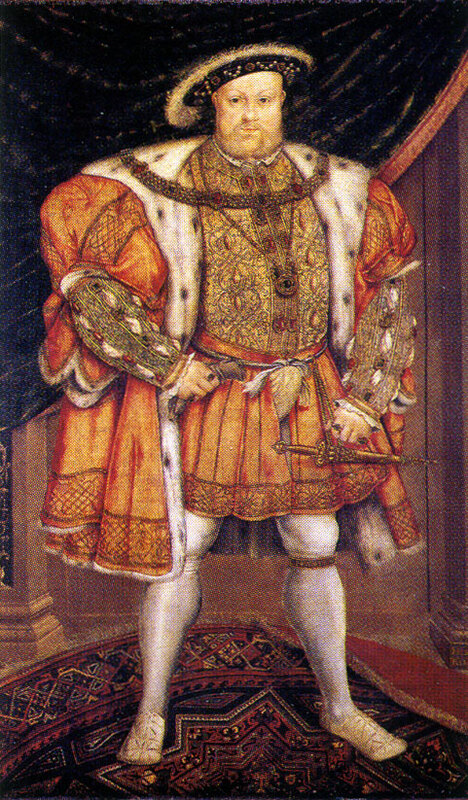 King Edward VI, Henry VIII’s only son and heir, continued in the fashions of his father. However, he used those styles to attempt to hide is small, slight figure rather than to accentuate his manly features as his father did. All though the rule of Lady Jane Grey lasted only nine days, she did manage to bring more high-necked, Spanish-style surcoat gowns into style. Queen Mary was not particularly popular, so did not have much influence on fashions of the time, although she was reported as wearing very ostentatious, bejeweled clothing. And now we come to Elizabeth I. She was very fond of clothing, so much so that when she died she had over 3,000 gowns and headpieces in her wardrobe. Although she was never considered a great beauty, her style was widely admired and mimicked. She was a tiny woman–small-breasted and small-waisted. consequently, fashions accented a silhouette of a long, flat, narrow torso. Even men wore corsets to try to make their bodies fit this mode. Her pale complexion and high forehead caused women to wear even more white powder/paste on their faces than before and pluck their foreheads and eyebrows (Elizabeth actually died from lead poisoning from the lead that was in the white makeup she used to cover her smallpox scars). She also loved elaborate clothing just as much, if not more, than her father. Her outfits were always lavished with jewels, embroidery, ribbons, and lace. Her particular favorites were pearls, representing her image as the “Virgin Queen.” The below painting is her “Rainbow Portrait” and depicts the color and embellishments always decorating her gowns and headdresses. This next portrait is her “Armada Portrait,” painted shortly after the defeat of the Spanish Armada. It portrays the styles she made fashionable, including the ruff, wasp waist, and leg-of-mutton sleeves, as well as her love of pearls. Queen Elizabeth was one of the most loved monarchs of all time, and her influence in the realm of fashion is a good example of her influence over people, as well as their devotion to her. Once again I shall make a glossary of clothing terms, this time from the Renaissance. Some of the terms I defined for Medieval clothing were also used during the Renaissance and I will most likely use some of those terms in current posts, so their definitions can be found here. In about 1450, when the printing press was invented, a new era was ushered in, an era of quickly circulating information that allowed for new inventions, new styles, and new discoveries: the Renaissance. This colorful era began respectively in Florence, Italy, but soon spread to the rest of Europe and music, art, and literature flourished. The subsequent fashions that came with this were still deeply influenced by late medieval fashions, but they also had a personality of their own. Sometimes these fashions in England are referred to as Tudor or Elizabethan fashions because they were heavily influenced by the English monarchs, especially Elizabeth I. Just as Italy began as the center of the arts, so it began as the center of new fashions. As the middle class expanded, fashion became an important pastime to them as well as the nobility. Fashions around Europe also became more unified as transportation and communication improved (again, thanks to the printing press) and costume ideas and materials were able to spread throughout the area. Some of the styles that endured throughout the Renaissance included slashing**, where the outer clothing was cut in slits and the underclothing slightly pulled through, the ruff, a circular collar of starched and pleated fabric (these continued to get larger and more elaborate as the era progressed), and detachable sleeves, which allowed for a more affordable method of changing one’s outfit. Fans also became very popular accessories (especially in the court of Elizabeth I) after Columbus brought the first feather fan to Queen Isabella from the Americas. They were mostly more for decoration than for practical use and were decorated with jewels and made of ivory and expensive feathers. Catherine de Medici made the folding fan popular which was usually attached by small chains or ribbons to the girdle. Handkerchiefs also became important in signifying wealth and power. Sumptuary laws were passed prohibiting the lower class from using them. They became increasingly decorative, edged with lace and embroidered exquisitely. Lace and perfume made their first appearances during the Renaissance. At the beginning of the Renaissance, clothing started to become rounder and fuller. Women’s clothing began with high waistlines, square necklines, and finestrella sleeves. However, waists continually lowered until they became extremely low, tapered, and v-shaped by the end of Elizabeth’s reign. Sleeves became rounder and had to be stuffed. Necklines remained square, though in the second half of the period they were often risen to the neck to accommodate the ruff. The farthingale was perhaps the biggest contribution of the Renaissance. When first used, is was conical in shape with wire hoops graduated in size (often called a “Spanish farthingale”). However, by the end of the era it had widened into a conical barrel shape (“French farthingale”). The increasing size of the farthingale needed a lot of material to furnish it, and laws were passed to try to curtail their use (these laws were very much ignored). Skirts also became shorter so they might show pretty high-heeled shoes and even glimpses of stockings. Needless to say, during the entire Renaissance the desired female figure was shifting to a silhouette of wide shoulders, a long, narrow waist, a flat chest, and full hips, which was mostly modeled after the slight but ever so influential figure of Elizabeth I. Another interesting phenomena with women’s fashions was that women would pluck their foreheads and sometimes entire eyebrows to have the appearance of a high forehead, and therefore intelligence, which was so worshipped during the Renaissance. Fashions progressive chronologically, the first image with fashions typical of the early Renaissance in Italy, with high waists and finestrella sleeves. Second image of fashions towards the middle of the Renaissance, influenced mostly by the Tudor court, with a square neckline, funnel sleeves, and a conical Spanish farthingale. Last image of fashions by the end of Elizabeth’s reign, with leg-of-mutton sleeves, long v-shaped waistline, ruff, and barrel-shaped French farthingale. Men’s clothing began with accentuating the shoulders and chest. They wore tunics and doublets reaching the knee, belted at the waist and stuffed in the chest and upper sleeves. Usually jerkins, often fur-lined, were worn over. Flat, wide hats were worn. Shirts were cut full and gathered at the wrists and necks. 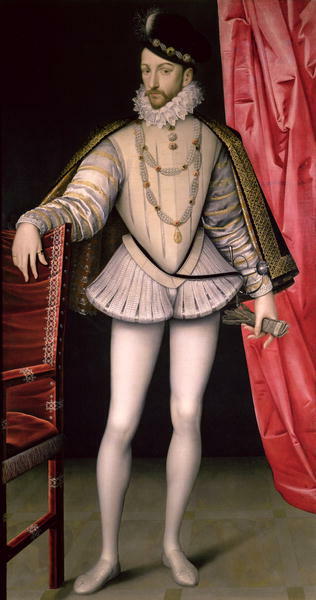 However, by the end of the period, short, pumpkin-shaped trunk hose were worn with tight hose to show off a man’s legs and men began wearing corsets to slim the torso. They also acquired the v-shaped waistline as women did. Peascod-belly doublets became popular, as well as leg-of-mutton sleeves, short capes, and more vertical caps often decorated with feathers. Ruffs and matching cuffs were essential. The first image is of men’s fashions towards the middlish of the Renaissance (before this men’s fashions had stayed the same as late Medieval fashions), with padded shoulders, jerkin, knee-length tunic, flat cap, and duckbill shoes. Second image from later Renaissance, with leg-of-mutton sleeves, short cape, short trunk hose, ruff, and v-shaped waistline of doublet. The occupation of a tailor became much more prestigious as nobles and even middle-class would hire personal tailors to create their day-to-day wardrobes. Tailor guilds and businesses spread and increased in power and many tailors created their own shops. The less successful tailors traveled around and worked for people who lived in the country and thus farther away from established tailor shops. Second-hand clothing was also a successful market as it was in the Middle Ages. Since clothing was so expensive due to the elaborate decorations required to be fashionable, many people, especially those of the middle class, had to resell clothing already worn to second-hand shops to regain enough money to buy new clothes. Overall, Renaissance fashions were characterized with a new scale of opulence and extravagance never quite reached in the Middle Ages. Jewels, pearls, gold, lace, and techniques such as slashing and puffing were used unscrupulously. Jewelry became very important during this time period to denote wealth and position. Fashions truly reflected the love of art, discovery, and new inventions that defined the Renaissance.